Mathematics - it's interesting and completely not boring. 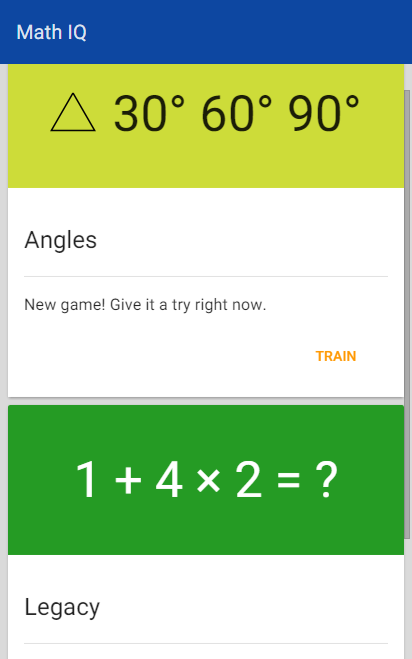 MathMaster – is a mathematical game (math puzzle) in which you have tosolve a lot of interesting mathematical examples, test your brainon counting in mind and, if necessary, to develop this skill. MathMaster mind game will help you to learn to count in your mindquickly and without errors, develop math skills. This game belongsto fun math games to help everyone develop abstract and logicalthinking, sharpen the intellect, develop perseverance, raise IQ,ability to analyze and memory. This math game will suit bothchildren and adults. Fun math. With multiple levels from simple toextremely complex, each of which includes set of mathematicaltasks, everyone can find something suitable. With each level thejob more complicated and more interesting. Train your brain andimprove your math skills! Complete all the levels and the status of"Master of Mathematics" is yours! Features: - addition examples; -subtractoin examples; - multiplication examples; - divisionexamples; - MIX mode examples including (addition, subtraction,multiplication and division); - equality tasks; - true or falsemode; - memory jobs; - large count of levels with differentdifficulty, over 150 levels; - plain and nice design; - friendlyinterface; - language: English, French, German, Spanish,Portuguese, Ukrainian, Russian, Filipino, Malay, Italian, Polish,Dutch, Czech, Danish, Turkish, Serbian, Slovenian, Hungarian,Slovak, Indonesian; - totally free application. It is recommendedto spend 10 minutes a day for train your brain. Any suggestions andcomments are wellcome! More levels coming soon. Have a nice game! Popular family puzzle with cool math games lovers! Over 300 millionplays worldwide! Do you think your grandpa snores loud? You havenot heard Elephant's snore! Get ready to stop the loud snoring inthis cool math animal puzzle for kids and adults! Snoring game isan ABSOLUTELY FREE physics animal puzzle game about Elephant andhis friends. Kids will improve their skills by learning andplaying, adults will relax while having fun! FEATURES of the familypuzzle Snoring. Elephant game: - ABSOLUTELY FREE physics puzzle forkids & adults - 110+ funny, logical and challenging puzzles indifferent environments - 5 various worlds with outstanding graphicsand music - cute animals in the adorable characters - kid'sfriendly interface - addicting gameplay for learning and playing -localization into 13 languages. STORY of the family puzzle Snoring.Elephant game: The little cuddly animals cannot fall asleep becauseof a loud snoring of the Elephant. Zebra, owl, penguin and theirfriends exert every effort to wake up the huge sleeper and get awink of sleep at least for a minute. HOW TO PLAY the family puzzleSnoring. Elephant game: Think about your steps in advance, interactwith the local fauna, use the animals' skills, solve logicalpuzzles, unlock attractive new levels and help the animals toovercome the elephant's snore. LOCALIZATIONS of the animal puzzleSnoring. Elephant game: Now you can play the game in 13 differentlanguages: English, Spanish, French, German, Italian, Chinese(China), Japanese, Korean, Portuguese (Brasil), Portuguese(Portugal), Russian, Turkish, Vietnamese. Dive with your family andfriends in the incredibly funny adventure! Help cute animals towake up Mr. Elephant by rolling, jumping and solving all thepuzzles in this cool math logical puzzle for kids and adults. Playwith your children, parents and friends all free exciting levels inthe Jungle, Wild West, Tropical Island, Vikings' Land, Transylvaniato save exhausted animals from annoying Elephant's snore. ALMAGames will be grateful for your positive feedback in Android store.Kindly invite to visit our page Facebook.com/almagames for freshgame tips, news and sharing comments! Please, don't hesitate towrite your remarks and preferences at [email protected] too.If you like logical puzzles such the Snoring. Elephant game, tryother attractive cool math games by ALMA Games - Monsterland:Junior vs Senior, Monsterland: Fairy Tails, Alarmy. Wake up Alienand Hungry Cat around the World. Do you think you are good in Math ? Test your Math Skills with'King of Math' . It has so many variety games which will test yourmath skills. Categories : ✔️Addition ✔️Subtraction ✔️Multiplication✔️Division ✔️Exponentiation ✔️Square Root ✔️FREE to play Have Fun!!! *** Best FREE physics puzzle game for kids, toddlers and parents! *** Monsterland. Junior vs Senior is the fun family game, 100%irresistible for kids. Help the cutest Junior to wake up Senior inthis free physics-based puzzle that enhances logical thinking andproblem solving. Click away as few mean monster blocks as possibleto reunite a playful son and his tired dad for high scores and starratings. FEATURES of Monsterland. Junior vs Senior: - tone ofinteresting logical puzzles with problem-solving levels - logicalthinking - eliminate unfriendly monsters blocks in a specific order- cause and effect - explore how the monsters' world works - playand learn - solve challenging puzzles, enjoy merry melodies &stunning graphics. STORY of Monsterland. Junior vs Senior: Junioris the incredibly energetic child. This little red monster blockwants to run, jump & rollick. But his father Senior has got sotired and doesn't want to play with the son. Maybe you can changethat in this eye-infested tumble-drop physics game Monsterland:Junior vs Senior. LOCALIZATIONS of Monsterland. Junior vs Senior:You can now play Monsterland. Junior vs Senior fun puzzle game in11 different languages: English, French, German, Italian, Chinese(China), Japanese, Korean, Portuguese (Brasil), Portuguese(Portugal), Russian, Spanish. Monsterland habitats are so cute,there are Yellow, Pink, Violet, Blue block-monsters, wise Cyclope,slippy Fly and flexible Jumper among them. Explore these adorablecreatures and objects so Junior can land on Senior and wake him up!Interesting puzzles, adorable music, colourful design, cartoonmonsters' land and a kid's merry laugh will bring so much pleasureand fun, guaranteed! Monsterland. Junior vs Senior is awesome freebrain game for mobile phones and tablets. It's fun for players ofall ages (from kids to adults) and abilities. What remains to wait?Download the best logic puzzle and play with your friend and familyright now! Follow ALMA Games on https://www.facebook.com/almagamesVisit our site http://alma-games.com/ Write us on [email protected] Want to go further? If you like familypuzzles, cool math games as Monsterland. Junior vs Senior and wantto play more levels, please enjoy the 2-nd part of this story -Monsterland: Fairy Tails. More interesting puzzles, new charactersand so much fun! Also, you can try other cool math games by ALMAGames: Snoring. Elephant game, Alarmy & Monster Family, HungryCat around the world. An efficient educational game for kids. It allows to improve mentalcalculation skills easily and quickly. Learn and train: - addition- subtraction - multiplication - division The app comprises of 10+exciting games. Everyone will find interesting and funny things todo here. Math games help to develop mental skills, improve memory,focus, and mental speed. Keep your brain fit through regular mathexcercises. Our games are ideal for kids making their first stepsin learning math, as well as for adults who like to solveinteresting puzzles and problems. Daily exercises are great for indeveloping math skills. Your brain will work faster and moreefficient!